We are used to seeing pools in suites and villas, but rooms with private infinity pools facing the ocean are a new design concept. While not cheap, these rooms offer an affordable way to experience what it feels like to cool off in your own private pool on vacation. Enjoy the outdoor space which comes with a terrace and plush chairs. The Romanos, Costa Navarino in Messinia, Greece is a designer getaway with two great golf courses, wonderful facilities for children and a first class spa. The hotel has 321 guest rooms and suites with private infinity pools (there are a few rooms without a pool, so be sure to check when you book). 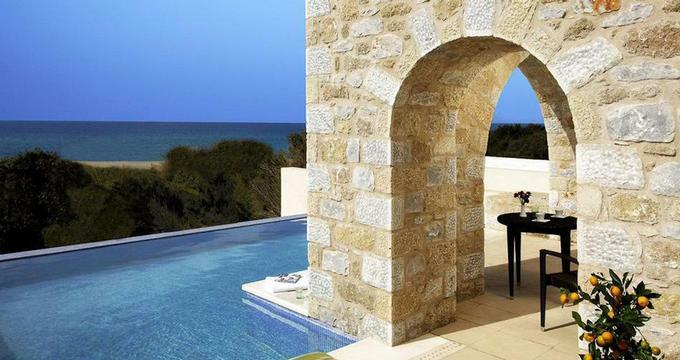 The three-bedroom Royal Villa Koroni received the European Hotel Design Award for its unique layout and decor. The villa sits on the edge of the Dunes Beach, offering unobstructed views, modern furnishings, a fireplace and plenty of privacy. Once you check into your plush room with a pool you may decide to stay in an enjoy the view. But if you have time to explore, Southern Greece offers ancient ruins and scenic attractions such as the Polylimnio Waterfalls. Anazoe Spa in Greece is a state-of-the-art wellness facility with beautiful design and a varied menu of treatments. "Anazoe" is derived from the Greek word for rejuvenation. The retreat is based on the Greek principle "a healthy mind in a healthy body". Combine soothing treatments with relaxation on the resort's beautiful sandy beach. Choose from floating pools, indoor and outdoor treatment areas, kinisiotherapy, hydrotherapy, ice-grotto rooms and herbal saunas. The wellness center utilizes native plants to offer unique signature treatments customized to each guest. Signature treatments are based on the teachings of Hippocrates, the "father" of western medicine. If you are traveling with kids, there are treatments for younger guests as well. Plan a family getaway to this beautiful resort with plenty to do for the whole family. While grown-ups visit the spa, children get to play with their peers in a beautiful setting. There is an outdoor Aquapark where kids can splash around in the water and zoom down the water slide. For babies and toddlers (ages 4 months to 3 years), the property offers the Cocoon, a dedicated play area for you to enjoy with your baby or toddler. You will find art, children's books, song, dance, musical games, instruments, sculpture, drawing, role-playing and other activities. Rates for this program range from 28 to 50 Euro, depending on the age of the child. Children from 4 to 12 years can participate in half-day and full-day programs at the SandCastle. Through interactive games, kids learn about history, music, art and more. Sessions cost from 10 to 15 Euro. SandCastle offers evening activities during certain times of the year, giving you more time for a romantic dinner. Enjoy two scenic courses and a beautiful oceanside setting at the Romanos, Costa Navarino in Greece: The Dunes and The Bay Course. Navarino Dunes, designed by the Ryder Cup captain Bernhard Langer, offers beautiful ocean and river views, as well as inland holes where you'll be surrounded by olive and citrus groves. Designed by the famous designer Robert Trent Jones Jr., the par-71 Bay Course features panoramic sea and mountain views. Book a tee time close to sunset and enjoy spectacular views along the historic Bay of Navarino. Rooms with infinity pools start at Euro 440.